Protesters from the Obama Library South Side CBA Coalition hold signs on their march to Jackson Park. 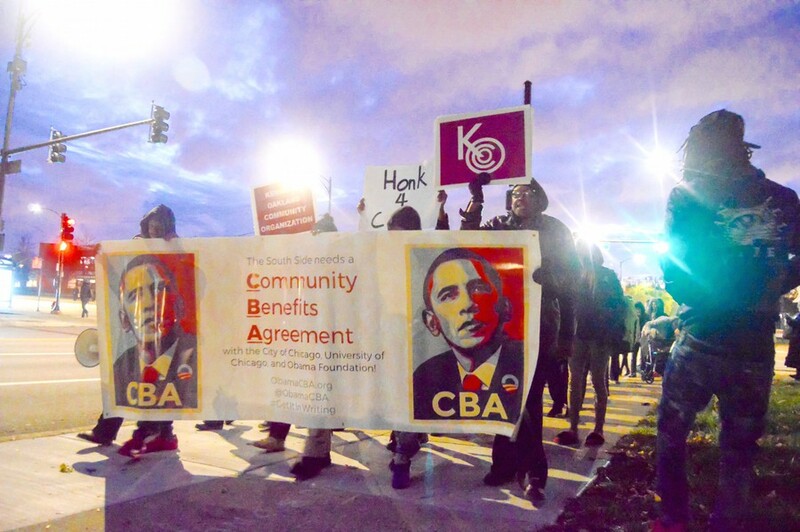 Members of the Obama Library South Side Community Benefits Agreement (CBA) Coalition marched to the site of the Obama Presidential Center and temporarily blocked Cornell Drive Tuesday afternoon. More than 100 marchers walked from Hyde Park Academy High School to the center’s planned site in Jackson Park, at 63rd Street and Cornell Drive. The group briefly blocked the intersection, chanting and holding signs. The coalition is pushing for a set of three CBAs with the Obama Foundation, the City of Chicago, and the University, respectively. At a press conference before the march, coalition leaders spoke about the need for a CBA to prevent area residents from being pushed out of their neighborhoods. A CBA could also require that residents receive benefits from the development, including support for local schools, job training, and replacement of the public park land the center will replace. The current plan for the center involves closing a stretch of Cornell Drive between 60th and 67th Streets, which coalition members fear will worsen traffic in the area. Robert Hayes, a fourth-year and member of student activist group UChicago for a CBA, said in a phone interview with The Maroon that holding the march and blocking Cornell Drive were valuable ways to show that the City, the center, and the University need to take South Side residents into consideration. “Last night, South Side communities came together to say enough is enough. Neighborhood resident members put out a powerful message: They refuse to be displaced from their homes, and they refuse to be silent until the Obama Foundation, City of Chicago, and U. of Chicago sign a legally-binding CBA for the Obama library,” Hayes said. Hayes said that one of the coalition’s current aims is to finalize language for a proposed city ordinance compelling the City and the Obama Foundation to engage in CBA negotiations. In a statement to The Maroon, Michael Strautmanis, the Obama Foundation’s vice president of civic engagement, said that the Foundation believes continued dialogue will benefit residents more than will a CBA. Strautmanis cited the Foundation’s goals to award 50 percent or more of its subcontracts to businesses owned by minorities, women, veterans, people with disabilities, and LGBTQ+ people and emphasized the center’s commitment to establishing job training and retention programs.